This kit contains a (two-wire) power trim/tilt electric motor, junction box/wiring harness assembly and other small hardware. It will convert engines with (three-wire) power trim/tilt electric motor on models manufactured from 1976 to 1979 and CS through CI, to the current (two-wire) electric motor, relay box and wiring harness. This kit should be installed by an experienced service technician using current technical literature. These instructions are not intended for consumer use. Read these installation instructions completely before starting work. 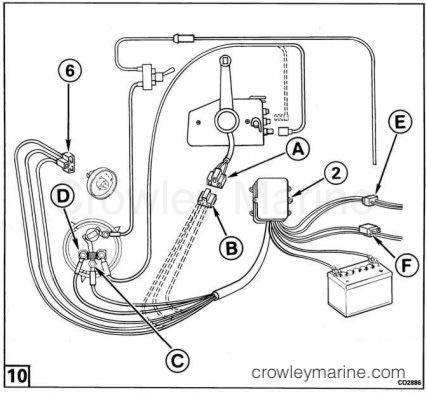 Important: Retain these installation instructions with your Owner/Operator's Manual. They contain a parts list, installation and operating information for future reference. Tilt motor to full tilt position and engage tilt lock lever (A) in tilt up position. Install a holding strap or a rope (B) around lower unit to make certain unit will not accidentally fall down. Remove the power trim/tilt motor leads from the "T" connector. Remove wires through port stern bracket hole. Remove the power trim/tilt unit from the engines stern bracket assembly. Refer to the appropriate Service Manual for the model engine which is being serviced, for disassembly, reassembly, torque specifications and testing procedures. Remove the three large electric motor retaining screws and washers. Remove the electric motor from the manifold. Remove the existing junction box, wire harness and battery cable assembly and discard. Retain mounting hardware for assembly. Clean the top of the manifold where it engages the motor. Install a new O-ring (7) on the motor. Position the motor (1) on the manifold and install the three screws and lockwashers. Torque screws 60-80 in. lbs. (7-9 Nm). Route trim/tilt leads through port stern bracket bushing. Install trim/tilt unit into stern bracket. Install blue and green leads from the trim/tilt unit into the "T" connector (5). Make sure that the blue and green wires from the trim/tilt match up with the junction box blue and green wires when they are plugged together. Cut existing connectors from black wires of sending unit. Attach terminals (4) to sending unit wires. Install terminals from the sending unit into square connector (3). Install new trim/tilt junction box and wire harness (2) in boat. Allow sufficient slack to operate control handle through complete operating range. If the trim/tilt switch is dash mounted, remove connector (B) and replace with dash connector (6). Use correct connector from kit to match existing connector. The black/tan lead (C) is connected to the "G" terminal and the white/tan lead (D) is connected to the "S" terminal of the trim gauge. Plug sending unit (E) and trim/tilt motor (F) connectors to mating connectors. 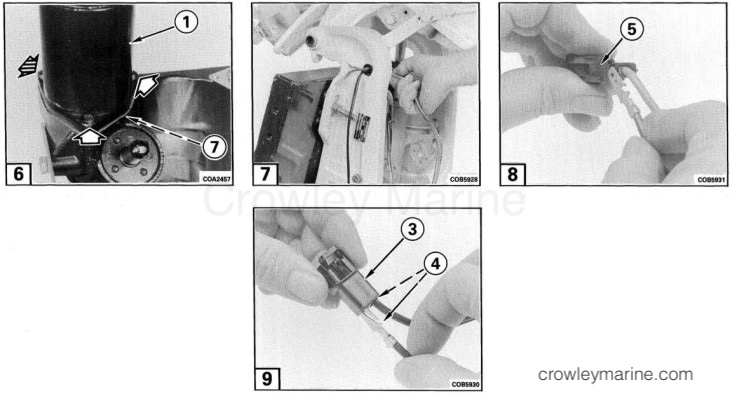 Apply Terminal Grease (8) into ends of all connectors. Make sure key switch is in OFF position. Connect positive (red) cable to battery, then connect negative cable to battery and tighten securely. Test the trim/tilt unit for correct operation. When switch is in UP position, unit should raise. Cycle the trim/tilt unit up and down several times to check for leaks and proper operation. If unit does not operate correctly, air in the hydraulic system may be the cause. To purge air from the system, cycle the unit up and down five more times.